Considered by many to be the greatest opera of the 20th century, Alban Berg’s 2nd and final opera, Lulu, will open in a new production by William Kentridge at the Metropolitan Opera on Thursday, November 5th. It is one of the most anticipated performances of the season. Lulu had its Met premiere on March 18, 1977, in a John Dexter production, conducted by James Levine and with Carole Farley in the title role. At the time of his death in 1935, Berg had completed only portions of the 3rd act (including the opening, the interlude between scenes one and two, and the grim finale). The Met performed acts one and two and, then, interpolated a third act by using the material that Berg had completed, adding music from his Lulu Suite and spoken dialogue from the source material, Frank Wedekind’s two Lulu plays. Even though Berg had left an incomplete score, there was enough material available for it to be finished. Following Berg’s death, Austrian musician Erwin Stein prepared a vocal score of the complete 3rd act, working from Berg’s sketches. Berg’s widow – Helene – reached out to influential composer Arnold Schoenberg to complete the orchestration of the 3rd act, a task he at first accepted, but subsequently declined. The public story is that, upon reflection, he decided that the scope of work would be too time consuming; another explanation for Schoenberg’s change of heart is that he was offended by the use of an anti-Semitic slur – “Saujud” or “pig-Jew” – in the libretto. Helene, being fiercely protective of the opera, thereafter refused to allow anyone else to complete the 3rd act and, until her death in 1976, the opera was performed in the two-act version and sometimes, as in the 1977 Met production, a 3rd act was interpolated from material that was available. Immediately following Helene’s death, the rights to complete the work became available and the project was entrusted to Viennese composer and conductor, Friedrich Cerha. 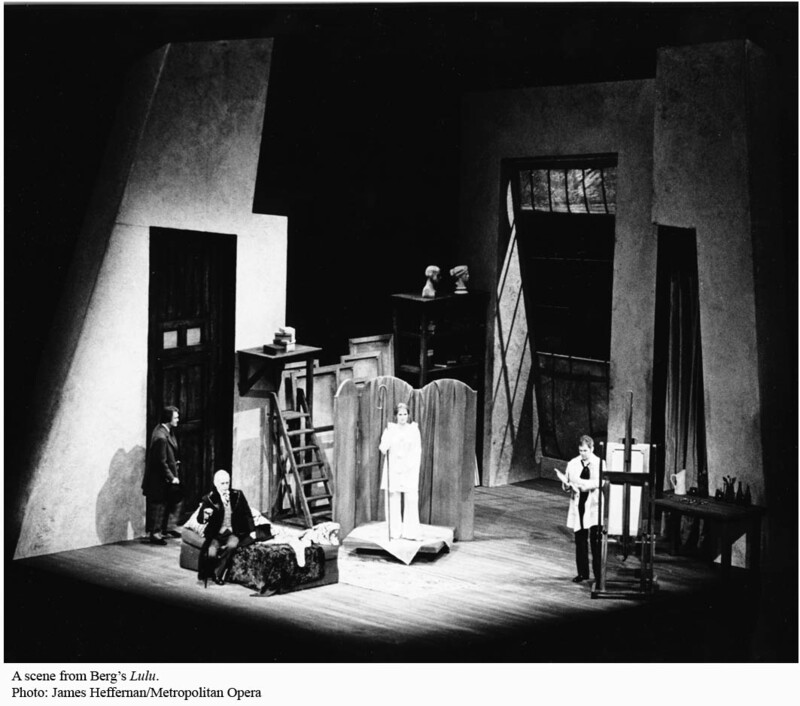 Although his work was not finished in time for the 1977 Met performances, the world premiere of the complete Lulu was presented by the Paris Opera on February 24, 1979, conducted by Pierre Boulez, produced by Patrice Chereau (who, three years previously, had had a hugely controversial success with his production of the centenary Der Ring des Niebelungen at the 1976 Bayreuth Festival), and with famed Canadian soprano Teresa Stratas in the title role. 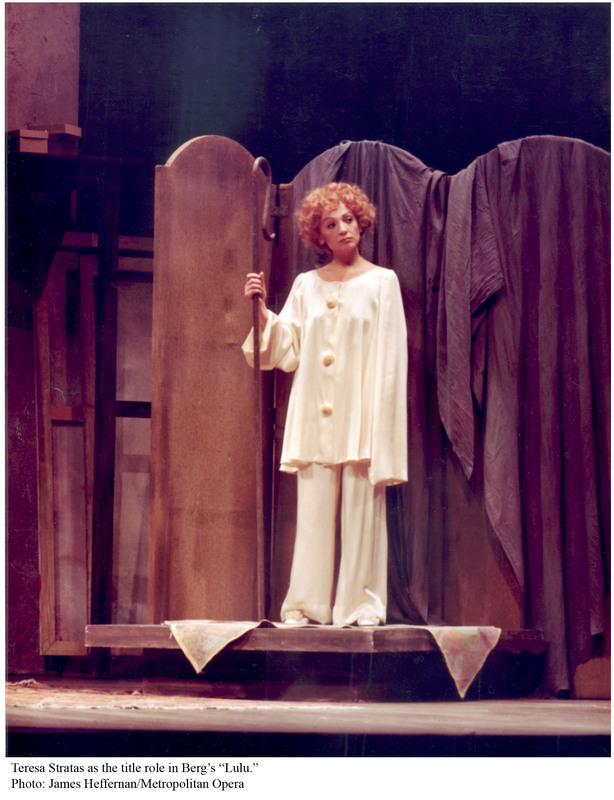 The Met premiere of the three-act Lulu was in December 1980, again with Levine on the podium and Stratas onstage as Lulu. A new production of Lulu is always met with great anticipation because of the demands placed on all participants – from the conductor to the singers to the director and the designers, and, not least, the audience – everyone is challenged to up his game. What is it about Lulu that is so exciting and, yet, so formidable? While it can be argued that many operas are music first and theatre second, Lulu is theatrical to its core. To borrow an unattractive phrase used to describe the “old style” of operatic acting: you cannot park and bark but, rather, you must give a fully committed performance both musically AND dramatically. Both the Chereau and Dexter productions were not only fastidiously musical but, also, fabulously theatrical and cast with amazing singing actors, led by the charismatic Stratas. There are no fewer than 24 characters and, for purely dramatic reasons (and as indicated in Berg’s score), some singers play multiple roles. The title role requires not only the embodiment of the ultimate femme fatale, but also a voice that can handle a huge vocal range, coloratura, and declamation. In order to succeed, whoever portrays Lulu must also have star quality and the ability to seduce every character (less one) onstage as well as everyone in the audience. It is a tall order. I am no musicologist by any measure, but I can tell you that the musical structure of Lulu is like a palindrome, which is fitting for the rise and fall saga of Lulu herself. While the musical composition relies on the 12-tone system, Berg brought to his score an intensely romantic approach. Operagoers who might be asked: “What would you prefer to see tonight – Aida or Lulu?” – will invariably choose the former because they believe that the music of Verdi will enchant them; but the more discerning operagoer must always choose Lulu: first, because it’s rarely presented and, more importantly, the musical riches and beauty of the score are irresistible. “It has become commonplace at the Metropolitan Opera for directors and designers of new productions, especially modernist high-concept ones, to be lustily booed by a sizeable contingent of the audience during opening night ovations. Making her role debut as the Countess Geschwitz, who may be the only character who truly loves Lulu (and, perhaps, the first openly lesbian character in all opera), will be Susan Graham, whose illustrious career includes such defining roles Didon in Les Troyens, the title character in Iphigénie en Tauride, and Marguerite in La Damnation de Faust. She has also championed contemporary opera, appearing in leading roles in Vanessa, The Aspern Papers, Dead Man Walking and The Great Gatsby. Finally, what would a new production be without a whiff of scandal? On Friday, October 2nd (a/k/a “news-dump-day”), the Met discreetly announced that James Levine, Music Director of the Met who has conducted all but a handful of the Met’s 35 performances of Lulu, had “dropped out” of the new production – 5 weeks before the work’s scheduled premiere. Mr. Levine has had many health challenges over the past half-dozen years, but it does seem odd that he would withdraw from performances of an opera that he has championed over the years so close to the first performance. Perhaps there’s more to tell, but that will have to wait for another day. In the meantime, I encourage anyone with an interest in great music theatre to get your tickets for Lulu. And, if you’re unable to make it to the Met to see it, you could instead attend the high definition transmission, which will be shown all over the world, on Saturday, November 21st at 12:30 PM (ET). Let’s Hear It for George Gershwin!